It’s that time of year again to get your kids prepped up for another great year of learning! 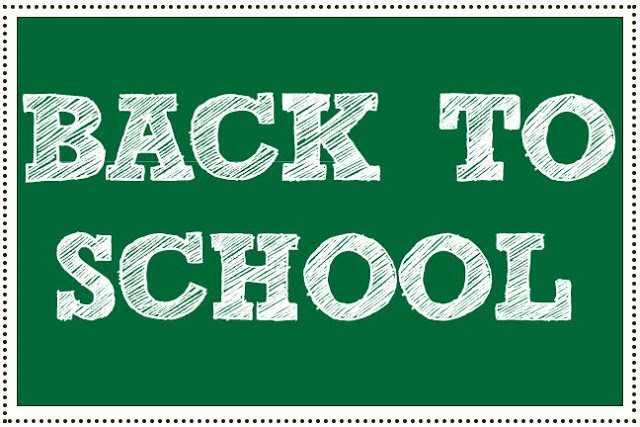 Now that you have all of your children’s school supplies, you’ve attend the “Teacher Meet and Greet”, you have fought the crowds in the mall to get all their back to school clothes, it’s finally time to plan for the most important part of their school year – Lunch! 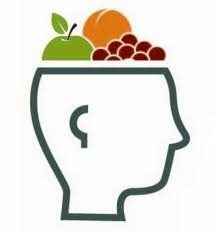 Did you know that the most sensitive organ in our bodies to chemicals and food allergies is the human brain? Most of us think it is the skin but it is the brain. 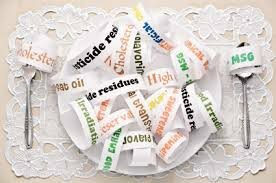 With that being said, we have to take a hard look at what’s in our kids food. Children are more vulnerable than adults to harmful chemicals that are found in everyday objects that they touch all day. Picking a lunchbox that is free of chemicals is not only important for your children’s health but smart for the environment, too. There are many great options out there. I personally like the Laptop Lunchbox and Lunchbots. When building a lunchbox is all about balance. Our fabulous nutritionist, Louise Goldberg with Apple a Day Nutrition Consulting, says that vegetables and fruits should always be present in their lunchbox. Even if you know they want eat the vegetables Louise says it is good to have it in there so you can teach them what a balance meal looks like. 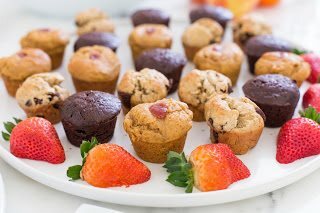 Louise also mentions in her blog to avoid giving sweets in the lunchbox, because they are going to go straight for that first rather than eating it at the end of their meal. Treat them every once in a while to a high quality chocolate kiss. Think Outside of the Bun! You can’t go wrong with a sandwich, but there is so much more you can do. 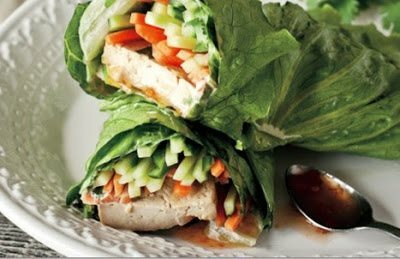 Forget the bun and wrap thin sliced carrots, cucumbers and lunch meet in lettuce. Use a tortilla instead of a bread. Soup is always a great way to sneak in vegetables. Use a thermos to keep it nice and warm. Leftovers can also be a godsend to reheat and use a thermos. Also, it doesn’t always have to be hot, my daughter loves pizza or pasta leftovers cold. 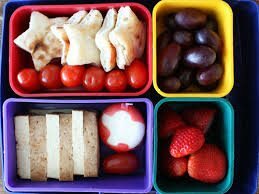 Pack a “bento” box or any container with 5 smaller “snack” type items for you little one to have a wide variety like I highlighted in a previous blog post: Back to School Snacks & Lunch Ideas. We also Love our dietitian’s recipe page for tasty and healthy ideas: An Apple a Day Nutrition Consulting Recipe Page. Use a vegetable peeler to shave a handful of carrots and cucumbers. Lay out your washed romaine leaves and pat dry. Spread mustard on the lettuce. Layer the sandwich meat, carrots and cucumbers and roll up nice in tight. Snacking is probably the hardest category to stay strong with good clean foods. There are multiple aisles in the grocery store dedicated to processed snacks that are directly marketed to kids. Try to avoid those as much as possible and hit the outer perimeter of the grocery store for good sources of snacks. Cut up fruit and veggies in your fridge for quick and easy snacks. 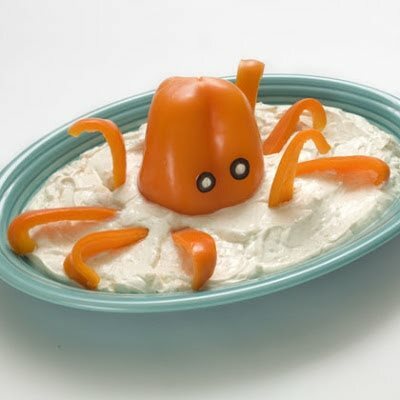 Vegetables can be paired with hummus and fruits go great with low sugar yogurt. Peanut butter goes great with celery and even apples. We pride ourselves at Green Plate Kitchen to make nutritionally dense snacks, replacing oil and refined sugars with pureed veggies and fruit. Some of our most popular our are Banana Chocolate Chip Muffins packed with butternut squash and made with whole wheat flour and applesauce. If you lucky enough to live in Houston, many of our snacks and healthy treats can be found at Whole Foods Market and HEB. Check our locations page for an up to date listing. Our children learn from us everyday by our attitude, actions and words, so it starts with us to be excited about clean eating. You are their role model! If you have not already embraced clean healthy living, get excited and tell yourself “I can and I will” start to help my family live a cleaner + healthier life. You will not only positively impact your family and help prevent future preventative diseases, but you will arm them with powerful knowledge that they will be able to positively impact their friends and their future families.